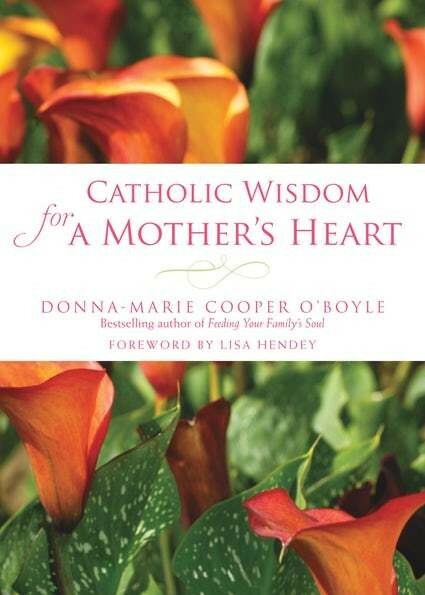 Catholic Wisdom for a Mother’s Heart is a creative and practical guide for a wide range of domestic church situations. Catholic women can live out their familial vocation with seasoned, simple suggestions for answering Christ’s universal call to holiness. Lovely poems conclude each chapter on a note of warmth that will lift hearts beyond the kitchen and up the path toward heaven. This resource is for Catholic mothers (and grandmothers who often fill the motherly role) who are in the trenches raising their children through thick and thin amid the bombardment of the culture. They need and crave the guidance, encouragement, and affirmation that this welcoming book will offer. Donna-Marie Cooper O’Boyle is a wife, mother of five, grandmother, blogger, catechist, EWTN TV host, and popular speaker who thoroughly enjoys her motherhood and considers it to be a sublime vocation. She feels passionate about inspiring mothers, women, and families. She also writes about prayer, family issues, the Church, and the saints. Donna-Marie was blessed to know St. Teresa of Calcutta for ten years; she became a Lay Missionary of Charity and St. Teresa wrote the foreword for Donna-Marie’s book Prayerfully Expecting. Donna-Marie is also the author of Feeding Your Family’s Soul (ISBN 978-1612618357), and other books for Paraclete.